If you're looking for the classic '50s Stratocaster sound, then these vintage-correct designed SSL-1 pickups not only sound authentic, but are also built with the same construction and materials as the original Strat pickup. This Seymour Duncan SSL-1 California '50s set consists of vintage-correct true single-coils, designed for warm instruments. 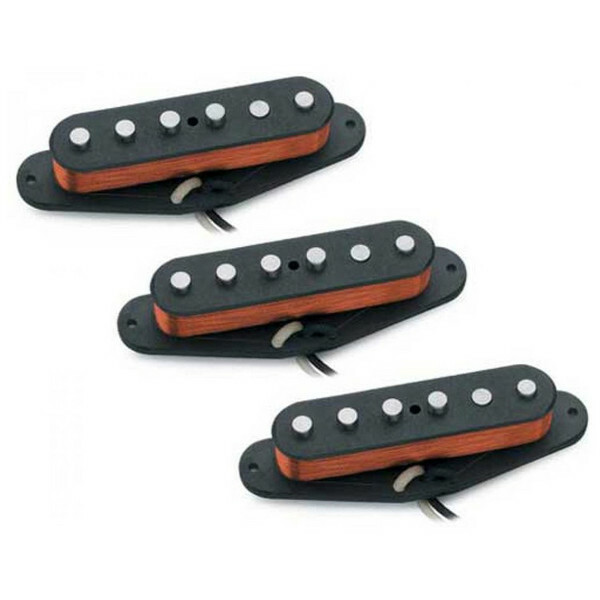 These pickups are recommended for country, pop, surf, blues, rockabilly, ska and classic rock. The SSL-1 boasts players like Chris Hicks, Kent Wells & Land Scott (Reba McEntire), Dan Schafer (Shania Twain), David Levitt (Alanis Morissette), Doug Pettibone (Lucinda Williams), Scott Henderson (Tribal Tech & Scott Henderson Trio) and Jimmy Crespo. That classic, familiar sound of a vintage Stratocaster, the one that gave birth to rock & roll, that's what you can get out of this calibrated set, providing your Strat® with the same type of pickups used in the '50s. The set boasts vintage-correct reproductions of the original Strat® pickup. Hand ground, sand cast, Alnico-5 magnets are arranged in a vintage, right-handed, stagger pattern. It has hand-fabricated, lacquered, forbon bobbins, heavy Formvar magnet wire and a waxed cloth hookup cable. The SSL-1 California '50s set's construction and materials are just as vintage correct as the sound. The familiar Strat sound is characterised by its sweet bell tone with high-end bite and "quack" in the notch positions. Positions "2" and "4" boast hum-canceling thanks to the reverse wound, reverse polarity middle pickup. This pickup set is designed for warmer toned ash, alder or basswood body instruments and works especially well with rosewood finger-boards. The bridge pickup is designed for bridges with traditional string spacing of 1.925" or 48.9mm measured over the bridge pickup.